Bad meat is a breeding ground for bacteria such as Staphylococcus, Salmonella, Bacillus, Clostridium and Escherichia coli. 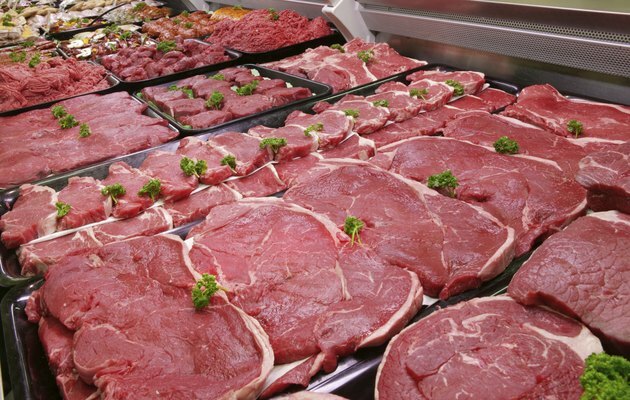 The U.S. Department of Agriculture reports that the amount of bacteria in meat can double every 20 minutes when left at temperatures from 40 degrees Fahrenheit to 140 degrees Fahrenheit, becoming a dangerous risk to your health. Cooking temperature and proper handling are key factors in the safety of eating meat. The USDA also recommends disposing of any meat that is spoiled or left in warm temperatures for more than one hour. Salmonella contaminates meat when left at temperatures below 140 degrees, either unrefrigerated or undercooked. Salmonella causes salmonellosis, a disease resulting in abdominal cramps, fever and diarrhea. Cooking spoiled meat until it reaches 150 degrees Fahrenheit destroys Salmonella. E. coli can grow in meat even when refrigerated or frozen. Cooking destroys the bacteria, but toxins usually remain in the meat, leaving it unsafe to eat. Inadequate heating or recontamination of the meat causes cramps, fever, intestinal problems and sometimes death. Two bacteria, Bacillus and Clostridium, bear spores. Intense heat deactivates them, but they produce spores that resist freezing and cooking. These spores result in illness. Clostridium spores produce botulism, a major cause of food disease. Cooking spoiled meat to a high temperature kills some bacteria, but can leave toxins behind. The remaining toxins cause food-borne illnesses, and cooking does not destroy them. Staphylococcus bacteria die from cooking, but produce heat-resistant toxins that cause nausea and diarrhea. Safe handling of meat helps prevent spoilage and bacteria growth. The USDA recommends buying your meat after you select all your other groceries to prevent the meat from sitting in the grocery cart too long. When you get home, refrigerate the meat right away in a refrigerator that is below 40 degrees Fahrenheit or freeze it. Defrost frozen meat in cold water, the microwave or in the refrigerator, rather than leaving it at room temperature where bacteria can grow. Consult the USDA recommended safe temperature chart when cooking any meat. The USDA recommends against eating spoiled meat, even if it is cooked. If you notice that the meat emits an ammonia or rancid odor, and is slimy or gray, it is probably spoiled. Mold on the meat also indicates spoilage. How Long After Thawing Meat Must You Cook It?